I'm really proud of myself for keeping up with doing three posts a week! AND that's while working on being productive in my life, too! I'm currently reorganizing a lot of spaces in my apartment as I realized I haven't really bought new furniture or changed anything up in like 4 years so it's all starting to look a bit dated... But a few trips to Ikea, HomeSense and other fun money-spending places has been helping with that! Anyway, you don't want to hear about my apartment changes I'm sure, so let's focus in on these neon-ly fabulous nails! So the only thing I had in mind for this mani was doing something that could fit with the 'Rainbow' prompt for this week's 30 Days of Colour prompt. 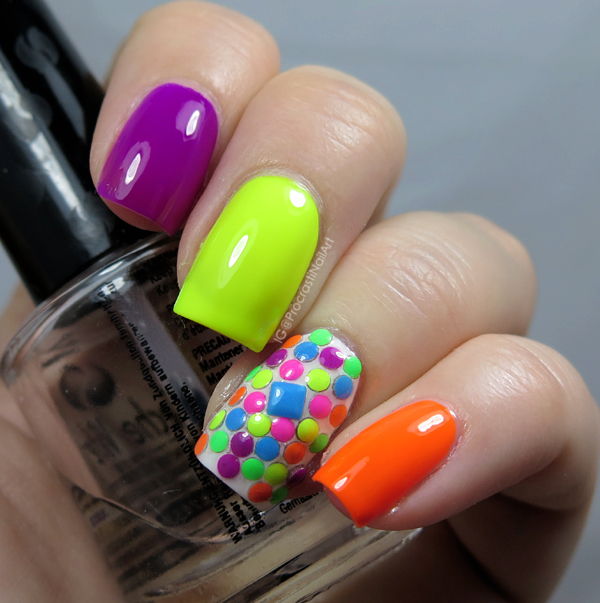 I decided to go with a skittle mani + accent nail! The first nail I did was the accent nail, and it started with two coats of Sinful Colors Snow Me White and then some top coat to stick on my neon metal studs from Born Pretty Store. I sealed these gems with two layers of top coat and they were almost totally smoothed down! I was really impressed, and it's been such a fun nail to idly run my fingers over this week (because yes I am still wearing this mani right now). To fill out the rest of my nails I used some of the neons from the Color Club Poptastic Neons: Koo-Koo-Cachoo, Mrs. Robinson and Yellin' Yellow! I feel the energy of this mani matches the energy I have right now, positive and upbeat and motivated! Now it's time to head back out to Ikea, haha! The colors are perfect with he accent nail! Wowza! That's some serious neon! I love how you captured the brightness of it - this mani looks great on you. 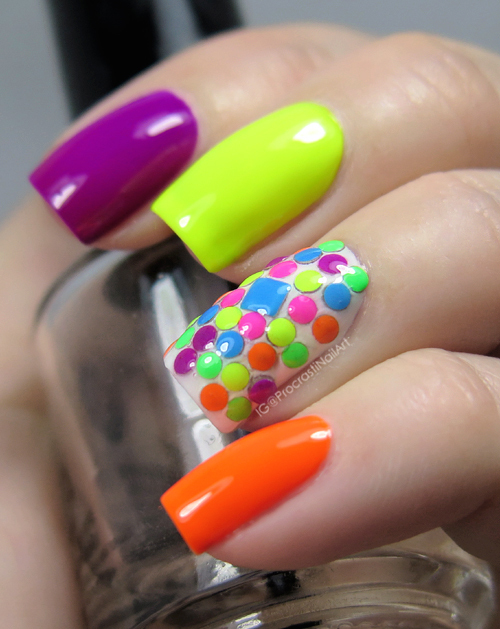 I love these neons! 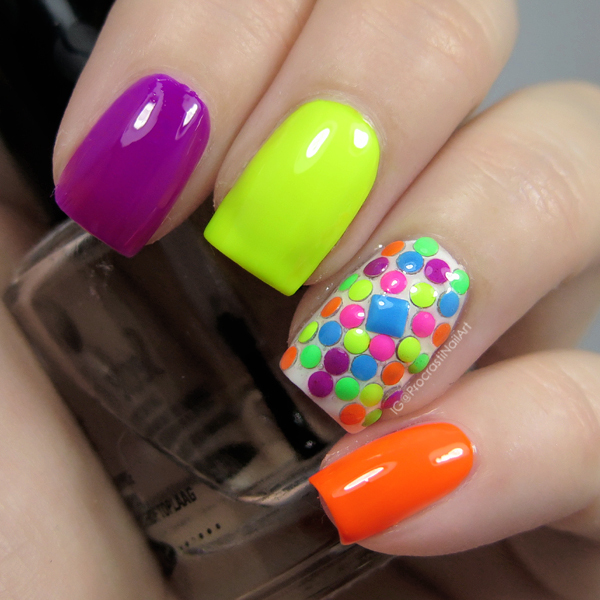 The accent nail reminds me of those mosaics out of colorful stones. Really fun and energetic! That stud placement is perfection! Love! Oooh I need these Color Clubs! Wow I love that Orange on your pinky!